On Monday, week two of school 2011, the Pt. 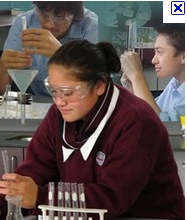 England year 7 & 8 students walked down to Tamaki College to do technology. We got split up in to groups of five. I went to science and the others went to wood work and all of that other stuff. It was boring but when it got to the end it was cool because the teacher was funny. In science we did some sorting out stuff and did some finding out about what’s living and what is extinct. Our teachers name is Mr Dewan. After all of our work we had a little break in lunch area, then we had to answer some questions that he would ask us. Then we would tell him the answer that we are thinking inside our head. After I was thinking I just gave him a random answer. Then it was time for us to pack up and head back to school. We all had to say thanks and line up at the door so we can head down to where we are meant to meet.